Dr. Arun Jetli has coached tennis as a member of the United States Professional Tennis Association (USPTA) for over 20 years. In 1984, he combined his vast knowledge of tennis with his Ph.D. in Philosopy to conceptualize a comprehensive training program specializing in the development of the junior player, now widely known as Arun's Tennis Academy. Arun's methodology of tennis instruction evolved from the legendary Harry Hopman - the renowned coach of the Australian Davis Cup team, who later developed John McEnroe and Vitas Gerulaitis. 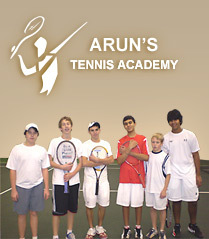 In 1976, Arun taught with Mr. Hopman at his Academy in Florida, assisting in the coaching of many world-class players. Since moving to Cleveland in 1980, Arun has coached scores of nationally and regionally ranked juniors, as well as touring professionals with whom he has traveled to such venues as Wimbledon and the U.S. Open.